Again with the Alt??!! Yup, more about Alt Design Summit. A little more. When you go to Alt it is IMPOSSIBLE to forget that you are with almost 500 other creative people. 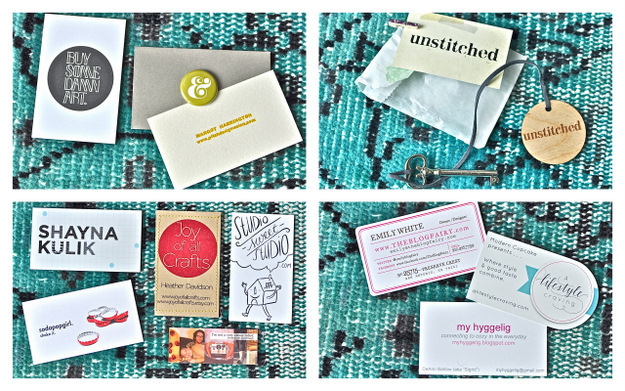 From the fab clothes and the stylish hair (the messy bun was THE "do") to the incredible business cards, it is a constant stream of inspiration. I am STILL digesting how much fun it was to be with a huge group of people who love stylish things and spaces, for whom blogging is not a four letter word! Here are some beautiful cards that I collected from a roundtable that I attended on the second day. For one hour on Friday right after breakfast we had a choice of 17, yes seventeen roundtables. I chose to go to "Bit Bloggers: The Why's and How's of Small Blogs" hosted by the lovely Margot Harrington of Pitch Design Unionand Kate Singleton of Art Hound. They run a site called Bit Bloggers that is all about being a little-engine-that-could blogger delivering quality content. Being a roundtable, we went round.the.table and each blogger talked about their challenges. Together we brainstormed. Don't you find better solutions when collaborating? Here are links to the roundtable attendees. Each unique and creative. Each living an interesting life with passion. Check them out. I know that I will.